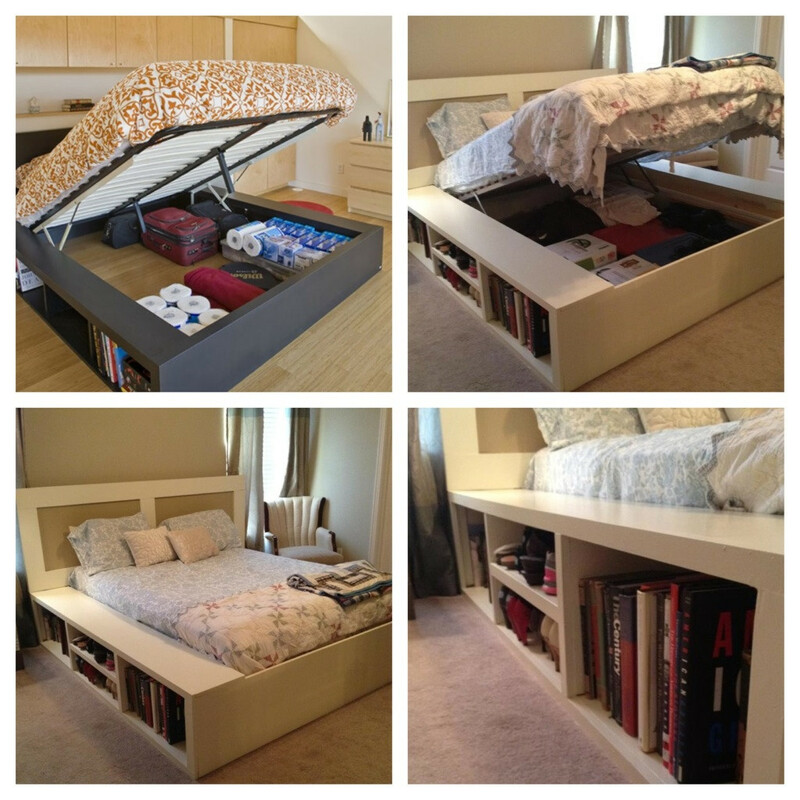 Description: As we live in a condo we really needed more storage space so after visiting this site (thanks a lot for the inspiration) I decided to build my own bed, for a Queen size mattress using 3 Expedit Shelving units and the other materials previously listed. Sadly I only have pictures of the finished product. Cut the 4 by 4 (you need 5 legs) to the exact width of the Shelving units. Those legs will be between the plywood INSIDE the space between the shelving units. One in the middle and one in each corner. So the weight of the mattress and the people sleeping on it will both be on the legs and the shelving units. You need a total of 4 plywood panels, 2 for the upper panel and 2 for the lower one that rests on the floor. The upper plywood is in 2 piece linked with a hinge so we can remove the mattress, open one side of the bed and access all that space between the shelving units. Both upper and lower plywood are simply wrapped in a Black king size sheet and we used wood tacks to fix it. It really give a great result and a LOT of storage space for everything we don’t use too often like camping stuff. You can put baskets in the shelving units for everything you use more often. 1) How much weight can this support?? I want to make sure it doesn’t break. 3) I can no longer find Expedit Shelved will Kallax do? I know it’s an old post I hope i get a reply. Can this be done with Kallax now that Expedit has been discontinued or do you need the 5 shelving units for a queen bed to properly fit? This is beautiful. Can you post your blog address, I am just not seeing it. Thank you. I’m preparing to create this bed, but I’m not able to determine whats being used to attach the 4x4s to the plywood. I’ve gone to home depot but cannot find those pieces.. and not sure if they are metal or plastic. Anyone please help. I do not know the official name “Fixing Base”, “Base”, “Post Base” or “Bolt Down Base”. They’re made of metal. Glad you liked the bed! Hello.. wondering how sturdy this is… say for couple that can get pretty “active” from time to time. we are thinking of doing 4 of these all lined up to make “tunnels” under the bed – and something else to make up the extra needed inches at the foot and head. .. covered with plywood between shelves and mattress – and attached to the wall. “and attached to the wall” that should help too. Wow, it’s gorgeous. I have storage under my bed, too, but it’s not that good to use. However yours look great and savvy. Thank you for sharing. I’m gonna buy this. Wish us luck… we’re going to tackle this this weekend or during this week. We’re getting supplies this weekend. Thank again for all you informative replies! the upper part of the plywood, the part at the head of the bed, is actually attached to the middle and top corners 4×4. The only part of plywood that is only sitting there is the half that can open. The shelves aren’t attached at all but they fit just perfectly there. Thanks so much for getting back to me! I love your design. Thanks for sharing it on here. I plan on using it after I get my new mattress around February/March. It’s just so hard to find storage beds geared towards adults. I always find children’s ones and they’re not the right size. And the adult ones don’t have that much storage space. I have a few more questions. I hope you don’t mind. How sturdy is it now that you’ve used if for a couple months? Any movement or sounds? What thickness plywood did you use? Where did you bind those cube bins that you put in the shelves? I’ve been to a few stores that carry similar ones, and they’re a bit too small. The ones you have seem to fit in there perfectly! How well is your mattress staying put? Does it move around much? I might think of a few more questions. I just want to be as prepared as possible when we (boyfriend and I) finally build it. Whoops, “bind” is supposed to be “find”. The mattress doesn’t move at all. Its easy to move when nobody is on it thought. The plywood we used is 3/4″ thick. The black and white fabric cube bins were available directly at the IKEA store 🙂 They’re made to fit the shelves perfectly. The bed is pretty sturdy IMO, it does crack a bit when you get in and out the bed, but I’ve never heard it while lying in bed. Plywood tend to move/curve a bit, depending on moisture, well like wood in general,so this might vary a bit. If you build it, just make sure that you cut the 4×4 to a perfect size to fit the shelves between the plywood so the plywood sits perfectly on it, its the main challenge 😛 As you can see in the additionnal pictures on my blog, we used some metal “footing” (not sure how you call those) that you fix on the 4×4 ends and that allow you to easily fix the plywood to it so you have to considers the thickness of those too when you cut your 4×4. Also, I strongly suggest that you buy an hinge that can cover the whole width of the bed where you can lift open the plywood, this way the two separate plywood pieces stay perfectly aligned. I’m glad to hear it’s holding up well! I went to the Ikea website and those bins were only available in green, black and pink when I looked. I hope they have white still in store! That’s the color I’m looking for. My boyfriend is good at this building stuff, I’ll let him know your recommendations and such. It does look like it would get a bit difficult to get those 4×4 exact with those footing things! So you recommend one really long hinge rather than a few smaller ones? I’ll definitely keep that in mind. Thanks so much for answering all my questions! I really appreciate it! So if the two footings add half an inch together, and lets say you need 20 inches then 20 – ½ = 19½ inches. Did you attach the plywood on top to anything? Or is it just sitting there? Are the shelves attached to anything in any way? If so, how? I’m hoping OP still monitors this. 🙂 I posted on their blog page with the additional pictures with no response. Do you remember where you purchased the bedding set?? It would go perfect with my ‘Victorian Goth’ themed room! We’re in Quebec (Canada) and my girlfriend found those in stores called Winners, they usually sell brand new stuff but a season late so always at a great price. Good luck! Your bed looks gorgeous. I really love the mattress color and its pattern that has luxurious look. Thank you for sharing. You’re an inspiration. Is your bed a queen or full? The mattress is Queen size. The base is a couple inches larger because it needed to fit with the Expedit storage unit size. Just saw that my post was published! Thanks for all the great comments! I’ll see If I can post some pictures of it without the mattress and with the top panel opened tonight, I’ve got some stuff to put in there anyways. The bedding is gorgeous! I love the black and white look! Always happy to see suggestions on how to get more storage space in an attractive way. Thank you for sharing! How many Expedit units did you use total? What’s in the back against the wall? Does it provide enough support while you’re sleeping? Would also like to see it without the mattress. One on each side and one at the foot of the bed. As you can imagine there is a lot of empty space between the shelving units so we place 5 4×4 support, one in the middle and one in each corner, which really gives a lot of support. More photos to come tonight I hope. Could you send pictures without the mattress? I Really like the result. That is what we need, under bed storage. But I wish there some more photos. I dont get it how you did. What size of Exprdit did you use?